Twenty-one of the schoolgirls kidnapped in 2014 by Boko Haram in Chibok, Nigeria, have been freed, the president's spokesman has confirmed. 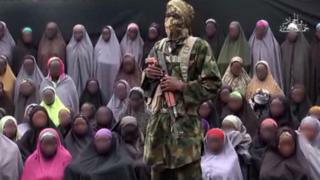 Garba Shehu said the release was "the outcome of negotiations between the administration and Islamist militants". A security official told the BBC several militants were freed in a swap - but the government later denied this. It sparked one of the biggest global social media campaigns, with tweeters using the hashtag #BringBackOurGirls. How was Chibok girls' release secured? President Muhammadu Buhari's spokesman said on Twitter that the International Committee of the Red Cross (ICRC) and the Swiss government had acted as mediators in the talks with Boko Haram. The girls, who are due to arrive in Abuja, would be examined by a team of doctors and psychologists, Information Minister Lai Mohammed told journalists in the capital Abuja. Mr Mohammed said the government was confident that this "credible first step" would lead to the eventual release of the remaining girls. However, he stressed that "this is not a swap". "It is a release, the product of painstaking negotiations and trust on both sides," the minister said. A security official has told the BBC that several top-level Boko Haram detainees were taken to a meeting point close to the Cameroon border. Under the supervision of the ICRC, the girls were then released and the militants were handed over. The students were then transported to the city of Maiduguri and placed under the supervision of the security forces. According to the security official, most of the young women have babies. Just last month the Nigerian government announced that several round of talks with Boko Haram had broken down, but with this release they have shown that those kidnapped can be released through intermediaries. "I can only weep, right now. You know that kind of cry that is a mix of multiple emotions," Obiageli Ezekwesili, one of the leaders of the #BringBackOurGirls movement, has tweeted in response to the news. The president also tweeted that he welcomed the release "following successful negotiations".